Please join us to celebrate the first Grand Gala in the history of our Club! We are planning a special event, exclusively for the Harvard community! We’re counting on your participation, to re-connect with the University that had such an impact on our lives. 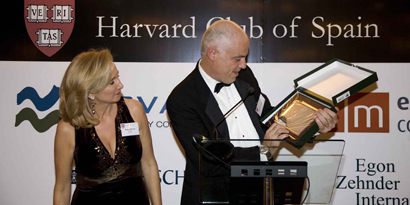 Our guest of honour will be Jose Manuel Campa, who holds a Ph.D. in Economics from Harvard and is currently Secretary of State for the Economy, as well as a member of the Club’s governing board. Those of us who know Jose Manuel know that he accepted his appointment – at this difficult time – out of a sense of responsibility and social commitment, to help improve the situation in which our country finds itself. We want to honour him and recognise this effort. I urge you to attend this festive event which we have organised with great care, and where we will have a dinner, a dance, drawings, prizes, and lots of surprises! Below you will find details about the event. To help us with planning, please confirm your attendance and send your fee just as soon as possible. Dress code: Men black tie or dark suit, long dresses for the ladies.